When I was in 7th grade, there was a kid, Matt, in my youth group. Problem was, I called him Mike for a good three or four weeks before he finally corrected me. Whoops. Now, more than ten years later, I think I'm finally getting the payback I deserve. At least once every couple of weeks, I get an email sent to me and addressed "Laura" or "Lauren". A far cry from Natalie! At least Matt and Mike started with the same letter! It seems people pull the "Laur" from McLaury and derive a new first name from it. I guess it could be worse, huh?, but I still shake my head every time I see "Dear Laura" at the beginning of an email. This grilled asparagus salad goes by an accurate name--it is indeed grilled asparagus in a salad. However, I don't think the name completely encompasses all that's happening in this salad. It isn't just grilled asparagus...it also has cucumbers, tomatoes, chickpeas, kalamata olives, cheddar cheese, basil, and a citrusy vinaigrette to top it off. Oh, and don't forget the pita chips eaten alongside! Sounds like good stuff, huh? I assure you, it is! This makes a rather large batch of salad, to serve at least 8 as a side dish. 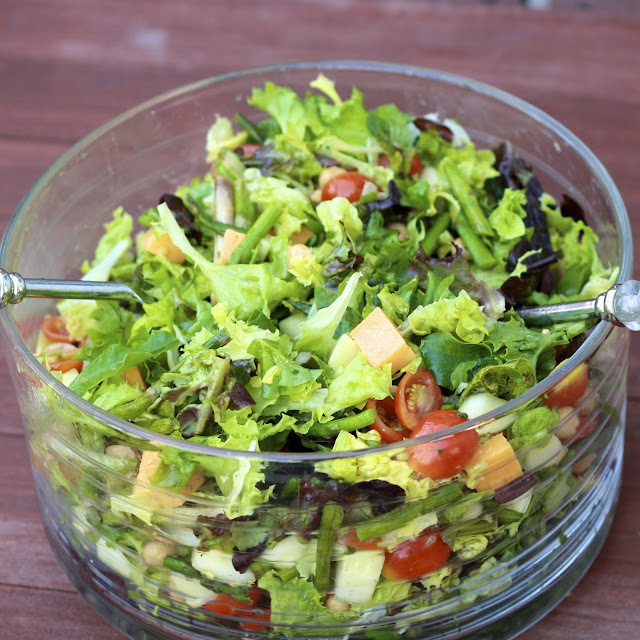 Its also hearty enough to serve as a main dish salad, and it (bonus!) requires no hot stove or oven, assuming you grill your asparagus outside. 1. Light a grill. Brush the asparagus with the oil and season with salt and pepper. Grill over high heat, turning, until tender, about 5 minutes. Allow to cool before cutting into 1-inch pieces. 2. 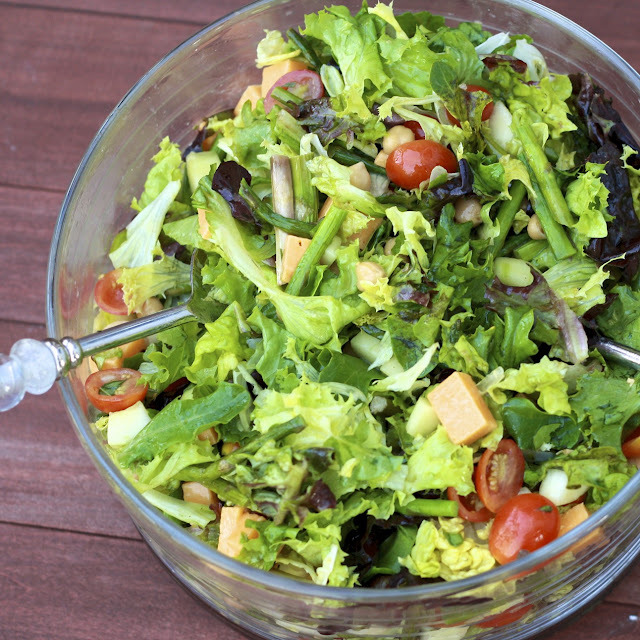 In a large bowl, toss the mixed greens with the grilled asparagus, cucumber, tomatoes, chickpeas, olives, and cheese. 3. In a small bowl, whisk together the orange juice, lemon juice, vinegar, mustard, and a pinch of salt and pepper. Gradually whisk in 1/2 cup olive oil until emulsified. Add the basil. 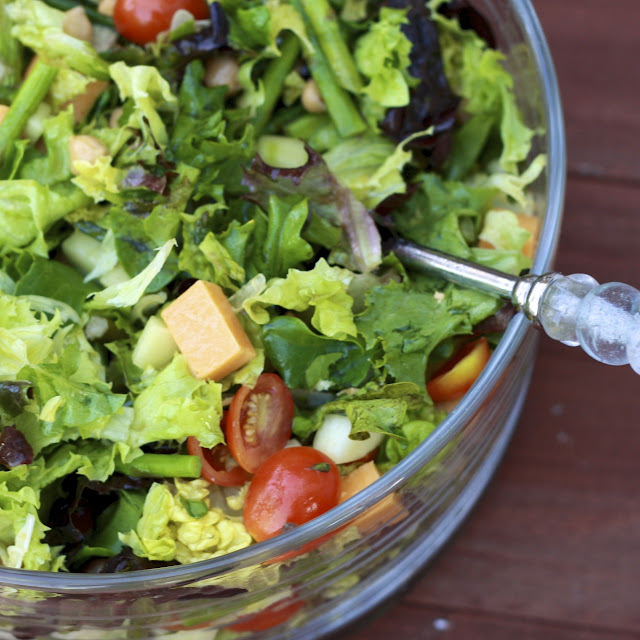 Pour the dressing over the salad and toss. Serve with pita chips.